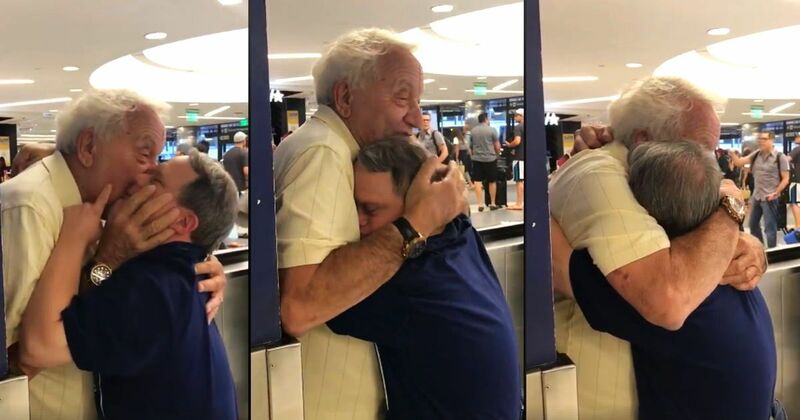 Heart-melting footage depicts the moment a dad is reunited with his son that has Down Syndrome after a week apart. Matt Cobrink, 53 years old, was flown to NY from the house he shares with his father Malcolm, 88 years old, in LA to meet his favorite baseball player, Aaron Judge of the New York Yankees. However, the trip meant that Matt would be away from his dad for almost a week, for the first time in twenty five years, since his mom passed away. Matt’s sister Marcy recorded the moment when the two were reunited because she knew how much they missed each other. Matt is seen rushing down the escalator and turning at the end to greet his dad, almost tripping over himself.